The following is a fascinating true to life story of Wijesim Peelige Bandiya, son of a Kandyan ‘ hack & burn’ peasant farmer, who sailed away from the Colombo harbour to the UK at a very tender age, with only three Australian pounds in his pocket, accompanied by Sir Oliver Goonatillake in 1948, married a German girl and transformed his life into something unimaginable over the years and returned to his roots as a ‘ laxapathiya’ (millionaire) and is now settled in a spacious house at the age of 86 with his brother Wijesim Peelige Ran Kira, 98 years old in Pahatha Dumbara, Kandy. Following are excerpts from an interview the writer had recently in Kandy with Wijesim Pelige Bandiya. Wijesim Peelige Bandiya was born on 9th November1928 to Wijesim Peelige Bāālaya and Delanka Peelige Koommali in a hamlet called Divela, Udagama in Kegalle District, in Sri Lanka. The Sinhala word ‘Peelige’, which means ‘in a continuous line’, has been used as a family (pelapath) name. ‘Peelige’ denotes the ancestral lineage for a particular clan (varige) that existed in the Ratnapura district coming down from the Sinhala Kingdoms. Other family groups that existed at the time were Rankoth Peelige, Rajamuny Peelige, ‘Kolabadudralage Pelige’ etc., who worked for the Maha Wahalkada (Palace). They were categorised after the type of service they performed to the King. In return the King allocated land to his subjects where they (his subjects) had to supply the produce after farming the lands. Stones and sharp spears were used to deter any advancement of enemy attacks during the old Sinhala Kingdoms. For this purpose stones had been stock piled at various locations. Gal Athara at Galgoda in Inigoda Korale had been one of those villages that stowed stocks of rocks. On the other hand, a lot of sharpened wooden staves had been buried to act as the deterrents that in modern times have been superseded by land mines! King Buwanekabahu III while living at Wakirigala Kande Palace in Kegalle district had allocated land to all his subjects, around 1000 acres in the Batale Gala area where each varige (clan) had to farm the land and supply the produce to the Maha Wahalkada. Great grand ancestors of Peelige Varige received approximately 200 acres of land, which included paddy fields in Harmathe, Weligannawa, Maakumbura and Rathmalgahamuladeniya. Wijesim Peelige Bāālaya was born to Wijesim Peelige Menika (Gem) and Delanka Peelige Koommali at Gongale Watta in Wakirigala. Gongale Watta was a ‘Ninda Gama’, which was full of cattle. During the Colonial rule the British had chased out all the villagers from their hamlets and handed the lands to the planters that made all the villagers, including Peeliges, disinherit their allocated land. This caused Peelige Varige lose out on everything, including acreage in Batalagala area (Apalawe Watta), which had been subsequently converted into rubber & tea estates. In 1900s Kandyan Peasantry Commission introduced a system to hand back the lost land to the previous ‘owners’; regrettably Peeliges had left the area by that time, thus lost out on everything. Wijesim Peelige Bandiya’s mother, Delanka Peelige Koommali, had been a pretty woman. His father Wijesim Peelige Bāālaya had abducted her at the age of just thirteen; however, with the intervention of parents finally they were married legally. In 1934 a grave tragedy occurred. Out of sheer jealousy and being ‘love possessed’ Wijesim Peelige Bāālaya stabbed his wife to death, right in front of their young son Bandiya. This naturally traumatised and affected the young boy to the extent that he did not want to go to school due to the psychological trauma implored within. One of his uncles Ammandi (mother’s brother) looked after Bandiya’s welfare for a short period of time. After about 6-8 months of the murder, Peelige family started to disintegrate and Bandiya’s elder brother Wijesim Peelige Ran Kira left the village and ended up at Aniwatta, Kandy doing odd jobs at Piachaud garden to make a living for survival. In the meanwhile Wijesim Peelige Bandiya was handed over to a Tamil family called Abrahams, and later he was taken out and handed over to a Burgher family called Lewis. Mr. Lewis had been an official at the Supreme Court at Magul Maduwa, Kandy, yet Ran Kira was not happy about the progress of his younger brother at Lewis’s. In his next move Ran Kira thought of a clever change of handing Bandiya to Geli Oya Sri Janaranjanarmaya temple. At first Wijesim Peelige Bandiya worked at the temple as a helper (Abiththiya). Seemingly the head priest at the temple ordained Bandiya as a young (Samanera) priest and gave him the first lesson in reading. He progressed his reading skills by going through a schoolbook called ‘Nam Potha’ where he advanced up to ‘Soorya Sathakaya’. Despite the tranquil ambiance inside the Buddhist temple and learning to read and settling down to a calm life, his flustered mind, after going through a vexing experience of his own father stabling the mother to death with a sharp knife made him more and more agitated and exasperated up to a point that one fine morning Bandiya took to his heels from the Geli Oya Sri Janaranjanarmaya Vihara without being noticed by anyone. Once again he was reunited with his brother Rankira in Kandy. By this time even Rankira was getting thoroughly confused and worried about his younger brother Bandiya’s future. After a few months of deliberations, Rankira accompanied Bandiya to Timbulagala Niggroda Ketha Pirivena and arranged him to learn Ayurveda or native medicine using diet, herbal treatment, and yogic breathing. A well-known dynasty in Sri Lanka called ‘The Nugawela family’ had initiated this Pirivena. How could a young perplexed mind, having witnessed his own mother being stabbed to death by his own father, be mollified within such a short spell of time? When mental turbulences began to overpower his puny mind, he took to his heels once again at around 2 a.m, from the Timbulagala Niggroda Ketha Pirivena and reached Geli Oya railway station after running for about two and a half miles! Back in Kandy once again, he arrived at a great aunt of his known as Kalu Nanda, who used to live at Aniwatta, which had been named once upon a time after an Englishman’s daughter named Ann. Over the years, Ann’s estate had gradually been transformed into what is known as Aniwatta! Inexhaustible Ran Kira despite having to shift Bandiya from place to place, fixed him yet again with a great grand uncle called, Dingiri Naide in Uda Konpale in Kurunegala who owned a recognised Kammala (blacksmith workshop) where tools and weapons such as swords, Kastans, hella (iron spikes), axes, and a special kind of Sinhala mamoty in the shape of a large lotus leaf were turned out. These items were scarce at the time, not being imported to the country; as such Dingiri Naide had been the sole supplier of such weaponry even to the king’s security forces at the time. 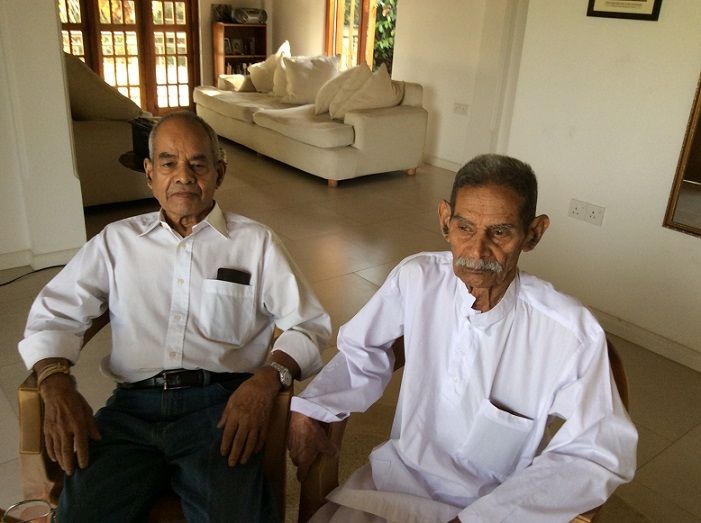 Having gone through every rack in trying to establish his young brother Wijesim Peelige Bandiya into some vocational training, finally Ran Kira took his brother to a Baptist Minister in Kandy, known as Rev. T. A. de Silva, whose wife Grace Matilda was a sister of the late Sir Oliver Goonatillake. Grace Matilda was a teacher at a Girls’ High School in Kandy. Rev. De Silva and family lived at Piachaud Gardens, originally in a large extent of land belonging to a Dutch couple, the Piachauds. Today, after seven decades, there are almost 70-80 homes in this land, some with spacious gardens. It is one of the better-known residential areas in the city of Kandy. Rev. T. A. de Silva adored Wijesim Peelige Bandiya and gave him an allowance of Rs.25 a month as pocket money in mid 1940s. Rev. De Silva in turn taught Bandiya to read with the help of ‘New Method Reader’, which was a reading series used in schools at the time. On the 1st of January 1944 Rev. T. A. de Silva baptised Wijesim Peelige Bandiya at Markevita Baptist Church by immersing his head sideways into a large Baptismal tank filled with water ; Rev. De Silva re-named Bandiya as ‘Peter Wijesinghe’. Along with him two others, Cabral brothers and Reginald Ranasinghe were baptised during the ceremony. On 23 December 1944, Wijesim Peelige Bandiya won the Class III first prize for reading after memorising 280 pages of reading material. His prize was a Sinhala copy of the Holy Bible from Rev. T. A de Silva personally autographed by Rev.T.A. De Silva by the writing his new name for the first time as Peter Wijesinghe. He treasures it with full of gratitude and carefully takes care of it even up to date. To be continued… Sir Oliver Goonatillake family…..
Nice to read about my dad’s people.